1. Act, Behave, Do : پیش آنا : (verb) behave in a certain manner; show a certain behavior; conduct or comport oneself. Tamasha : Show : the act of publicly exhibiting or entertaining. "You have stolen the show"
Chaal Calan, Chaal Calan : Conduct : manner of acting or controlling yourself. "His conduct is inappropriate"
Bartao, Rawiya, Rawiya, Bartao : Behavior : (behavioral attributes) the way a person behaves toward other people. "Your conduct is inappropriate"
Tameez, Dhang : Manner : a way of acting or behaving. "They don`t have manners to speak ?" How this page explains Pesh Aana ? We help you understand the word Pesh Aana in English. We not only provide English meaning of پیش آنا but also give extensive definition in English language. 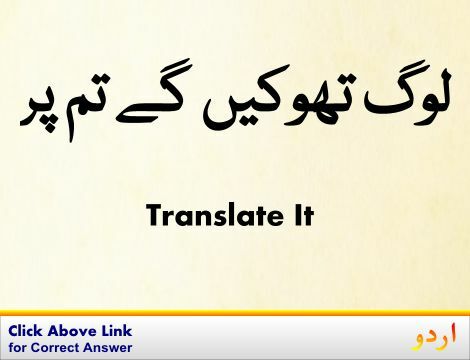 You can also find multiple synonyms or similar words along with Pesh Aana. You may also want to see Android app to get پیش آنا, please install Wordinn Urdu Android app now.